2.5cm fresh root ginger chopped .25 teaspoon Thai shrimp paste. Heat the oil in the baking dish / wok and then add the paste and turmeric and cook over a gentle heat, stirring frequently for 3 minutes. Add the water to the pan mixing well and simmer very gently for a further 3 minutes. Stir in the coconut milk, lime juice, sugar and season to taste and again simmer gently for 3 minutes. 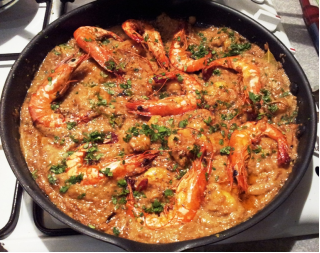 Add the prawns to the curry and cook for 5 minutes or until the prawns turn pink and are cooked through. Test again for seasoning. Transfer the curry to a warmed serving dish. Garnish with spring onions, coconut slices and desiccated coconut.